It has been almost four years since I have modified my eating habits and the way I cook. My belief is that healthy food does not have to be boring or taste bad. And a healthy lifestyle does not mean absolute restrictions. I allow myself to indulge sometimes, sometimes maybe too much. Nonetheless, I have tried to reflect these beliefs here. I was humbled that the people at POM Wonderful, specifically Diana, recognized my efforts and offered to send me a case of their one hundred percent pomegranate juice to help with this endeavor. Now, let me tell you, pomegranates are rock stars in my kitchen so you could imagine how thrilled I was to receive this gift. I could not wait to begin cooking with it. This is part one of a series of dishes made with pure pomegranates (the juice and fruit forms.) I will try my best to present them consecutively but don't hold me to that. Pomegranate juice can be used for more than the occasional cocktail. The health benefits are also spectacular. A slew of clinical studies has been conducted on the medicinal properties of this juice with positive results in the areas of cardiovascular health, prostate health, erectile function, and antioxidant potency. Antioxidants are molecules found in our bodies and in food that slow the process of cellular oxidation. Basically, when cells use oxygen , they release highly reactive atoms or molecules called free radicals. Some free radicals are important in biology but there are others whose side reactions can be detrimental to our health. For example, free radicals are thought to function in some cancers, and diseases such as atherosclerosis and Parkinson's disease. Antioxidants function to neutralize some of these harmful free radicals. While there are natural antioxidants in our bodies, many come from the types of foods we eat. Green tea, red wine, grape juice all contain some form of antioxidants. However, pomegranates contain higher concentrations than any of those. If that alone is not a reason to indulge in this fruit, I don't know what is. For more information on the many health benefits of pomegranates, click here. 1. Peel pears, being careful to retain the stem. 2. In a large pot over medium heat, combine the remaining ingredients and bring to a boil. Reduce heat to medium low and add the pears. Cook for 20 to 30 minutes, turning occasionally. Cook until the pears are tender, not soft and mushy. 3. Remove pears, cinnamon stick and star anise from the liquid. (Refrigerate pears in an air tight container until ready to serve.) Increase heat to medium high and allow to cook until the liquid has thickened to a syrupy consistency, being careful not to burn. 4. To serve, arrange a single pear and a scoop of mascarpone cheese (optional) on a serving plate, and drizzle with two tablespoons of syrup. 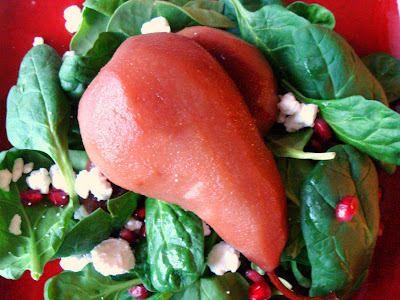 Alternatively, pears can be served on a mixed greens salad with goat cheese and pomegranate seeds as pictured below. The pear looks marvelous against the greens in the final photo! I haven't done much with pomegranate juice although I once helped take out the seeds for my MIL (what a mess I made!). Great info and recipe. A great health dessert! I totaly agree what you said on healthy food. This is a wonderful sample. I just wonder what you do with the rest of the syrup with pomegrante juice? Taking out the seeds can be a pain. The juice tends to get squirted everywhere! The remaining syrup can be drizzled over the poached fruit. Delicious! First time to ur blog,looks lovely.I havent used pomegranate in cooking so far, this was is surely tempting! Welcome to my blog and thanks for commenting. I hope you get to use pomegranate in your cooking soon. You're welcome. Hope you like these. Oh beautiful! 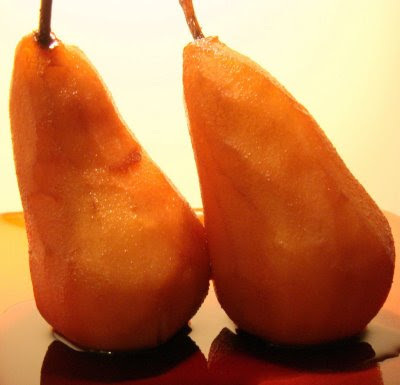 Love poached pears! What an amazing looking salad! Beautiful dessert Natasha lovely recipe. The pomegranate is very healthy and good color too!